It’s time to gather the materials for the upcoming STEM activity. Don’t think you have any? Think again. Open your cupboards and closet. Do you have paper cups? Craft sticks? Paper plates? What about toothpicks, straws and pipe cleaners? Check out your desk drawers. Gather the tape, paper clips, rubber bands and string. You now have some of the basic materials for your STEM activities and you didn’t need to look further than your classroom or home. Years ago, when we first discussed adding engineering to our curriculum, our principal was very excited. However, we were told that there was absolutely no money to purchase materials and tools. Upon examining our ideas for lessons, we realized that this would not present a problem. We could develop lessons with materials we already had in the classroom. And to be honest, the challenges we created with the throw-aways, recyclables, and readily available materials are still our favorites. Because most schools continue to have limited budgets we still design lessons that will be of no or low cost to teachers. The STEM lessons integrated into our curriculum provide the vehicle to introduce the skills that are important for students to develop as 21st century citizens – collaboration, teamwork, problem solving, and perseverance. Students are taught the Engineering Design Process as the framework to solve their challenges, as they learn to communicate ideas and accept that failure is an integral part of the process. As you will see, a well thought out design challenge for the students is central to a successful STEM program, even if the students are building their prototypes out of empty toilet paper rolls and cereal boxes. As we plan our design challenges for our students, we are careful that they are not just a fun activity but draw upon concepts that they are learning in other subjects. Building a tower is an instant attention grabber for students. One of our simplest activities involves handing pairs of students two pieces of newspaper or foil and challenging them to make the highest tower possible. While this appears as just a fun activity, students are actually learning to consider their materials and discuss concepts such as how changing a material’s shape and form can make it stronger as well as the basics of building a structure – most are wider at the bottom. 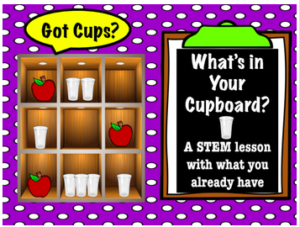 Our freebie activity using cups also explores structural concepts. This is part of our series, “What’s in Your Cupboard? What’s in Your Cupboard? Got Cups? Taking this same idea of building a structure and adding more materials, challenge your students to create a tower that is at least 25 centimeters tall that can hold an object of your choosing for 10 seconds. This design problem reinforces the concepts of metric measurement, structures and geometry (i.e. what is the strongest shape?). Discuss the challenge and distribute the materials. Remind the students that materials can be cut, folded or changed in any way that they choose. However, they will not receive extra materials. Set a time limit that is reasonable for your group. Twenty minutes is a good time for most groups. While building, encourage students who are struggling to take a walk to see what other students are doing. Ask open-ended questions to keep students on track. Remind them of the requirements such as the height of the tower. When time is up, measure the towers and test the strength of the tower. Make sure that groups that were unsuccessful are also given an to explain their design and their thinking. After all of the groups have shown their tower, discuss common difficulties encountered along the way. What are commonalities of successful towers? Options – one idea is to award points as a way to evaluate the towers. Mention roller coasters and you have captured your students’ interest. They provide a good review of force, motion and gravity in addition to being an intriguing mechanical engineering challenge. Roller coasters can be made with paper plates cut in a spiral or with cardboard tubes taped to wall. However our favorite material to use is foam insulation from the hardware store or Amazon. The top of the first hill must be the highest point on the roller coaster. The coaster must have at least one loop. There must be a cup at the end of the roller coaster and a marble must stay on the track and end in the cup. Encourage your students to build, test, analyze, and re-test their roller coaster to meet the criteria. If you would like to provide your students with an activity packet with worksheets for this lesson, we have one ready to download at our TpT store. This packet includes students worksheets and teacher notes for an investigation that uses the engineering design process. It is part of an amusement park series in our TpT store. There are frequent opportunities to integrate STEM into other subjects. Usually if you look at what you are already teaching and activities that are already planned, there is an easy way to integrate some engineering. We especially like to include STEM in history lessons. For example, the study of ancient civilizations provide many opportunities for engineering prototypes such as Roman domes and aqueducts, Egyptian Pyramids, or Greek columns. 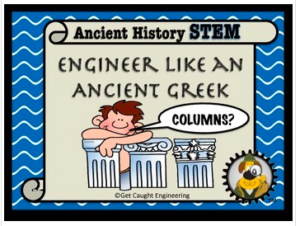 Our popular freebie for an Ancient Greece engineering lesson is ready to download with worksheets to guide the engineering design process. While studying Ancient Greece, integrate their use of columns by challenging your students to build a prototype of a museum that has columns instead of walls. First, review measurement skills that will be needed, basic geometry and mathematical shapes. The Greek museum prototype must fit on a cardboard or foam core base that is no larger than 30 cm by 30 cm. The columns must all be the same height and must have a paper roof that will then support a textbook. Placement of the columns will be crucial to the successful support of the roof and weight of the textbook. 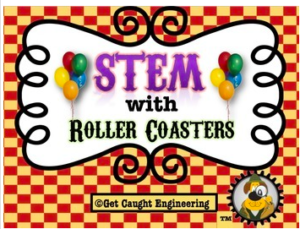 Towers, roller coasters, and columns are the just the beginning to creating a wide variety of low cost STEM challenges. Although there are some truly amazing STEM products on the market, your STEM program doesn’t have to break the bank. Providing your students with real world problems that can integrate into your curriculum lies at the core of a good STEM program. Those activities must rest on a foundation of challenges for your students to problem solve, communicate and persevere while working in their teams. And all of these challenges can be done using items that are typically found in your own home or classroom. 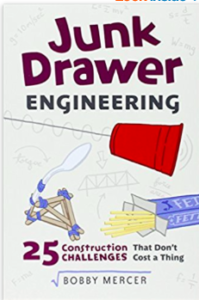 One of our favorite books for ideas that use simple materials is Junk Drawer Engineering, part of a great series by Bobby Mercer. It is fantastic resource to have on your bookshelf. Junk Drawer Engineering has 25 open-ended design challenges that can be performed for just pennies…or less. With suggested materials, step by step instructions and suggestions for adapting each project for different ages and skills,this will be a handy reference for any teacher who wants to add STEM to their classroom. Need some more ideas? Our Teacher Pay Teachers store, Get Caught Engineering® – STEM for Kids , has over 200 lessons that use simple materials as well as fun themes for integrating engineering into the curriculum. We hope your students “Get Caught Engineering®”! We are a participant in the Amazon Services LLC Associates Program, an affiliate advertising program designed to provide a means for us to earn fees by linking to Amazon.com and affiliated sites. The fees provide a source to support our costs of maintaining a website. Wendy is a National Board Certificated teacher and is the recipient of the National Science Foundation’s Presidential Award for Excellence in Mathematics and Science Teaching. She received a Japanese Fulbright Memorial Fund Award and was a finalist for the Albert Einstein Distinguished Educator Fellowship. She has consulted and written educational materials for numerous organizations including The Smithsonian and Discovery Education. She also served on the teacher advisory boards for Scholastic Publications and Time Magazine for Kids. Cheryl was a 2015 nominee for the Fairfax County School District Leadership Award. Cheryl and Wendy are the recipients of numerous STEM grants to fund their engineering programs. They were published in NSTA’s Science and Children journal, and regularly present workshops at state and national science and STEM conventions. They have developed STEM programs and workshops for The National Building Museum, The Bellevue Art Museum, The Smithsonian, as well as numerous schools and conferences. Cheryl and Wendy have been trained by the Boston Science Museum’s Engineering is Elementary program to present workshops and have attended educational training at NASA facilities. Wendy and Cheryl are eager to help spread the word on children’s engineering and STEM.